A glimpse into the teenage wasteland of suburbia 1999 that takes place over 24-hours, and the teenagers who make their way through the last day of high school in the last year of the past millennium. 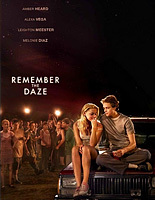 Clik here to see all the pictures of Amber Heard from “Remember The Daze” in the gallery of the website. Clik here to buy your dvd copy of ‘Remember The Daze’ online on Amazon.